This segment is part of our winter Book Club conversation about Mary Shelley’s 1818 novel Frankenstein. Want to participate? Sign up for our newsletter or call our special voicemail at 567-243-2456. After the Science Friday Book Club gets asked for homework help—and a voice mailbox flooded with one California classroom’s Frankenstein analyses—Ira talks to English teacher Chris Bach and his student, Tony Gonzalez, about the ways today’s 10th-graders are tackling technology, ethics, and modern life. Can’t get enough of these insightful student responses? Check back next week for more, or sign up for our newsletter to get them delivered straight to your inbox. In the meantime, check out a few of the responses from students in Chris Bach’s class at New Technology High School. Grab a copy of the book and start reading! Our drawing for a free copy of the novel has closed, but the story is free to the public online in a number of places. 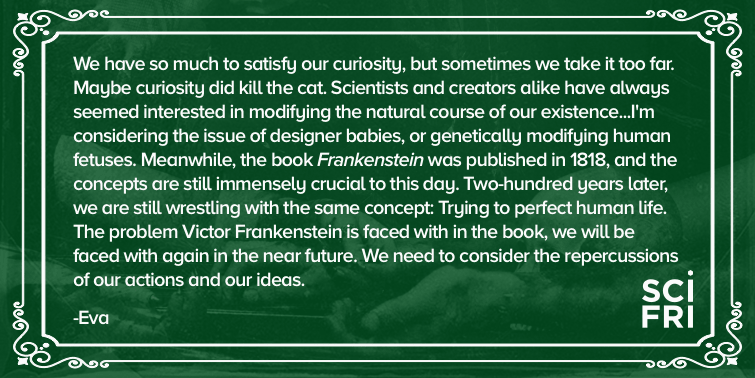 Check out Frankenbook.org, where the story is annotated by contemporary scientists and comes with several essays about its modern relevance. Still not sure if you want to jump in? Start with this excerpt, in which the monster first confronts his creator. Sign up for our SciFri Book Club newsletter to stay updated on extra reading suggestions, discussion questions, and events related to the Book Club. Take part in our wrap-up discussion of the Book Club by calling in to the broadcast on Friday, February 9. Discuss the book with Ira and our special guest readers, speculative fiction author Elizabeth Bear, and Hastings Center bioethicist Josephine Johnston. Can’t wait to join the conversation? Join the #SciFriBookClub discussion on Twitter, or leave us a voicemail! 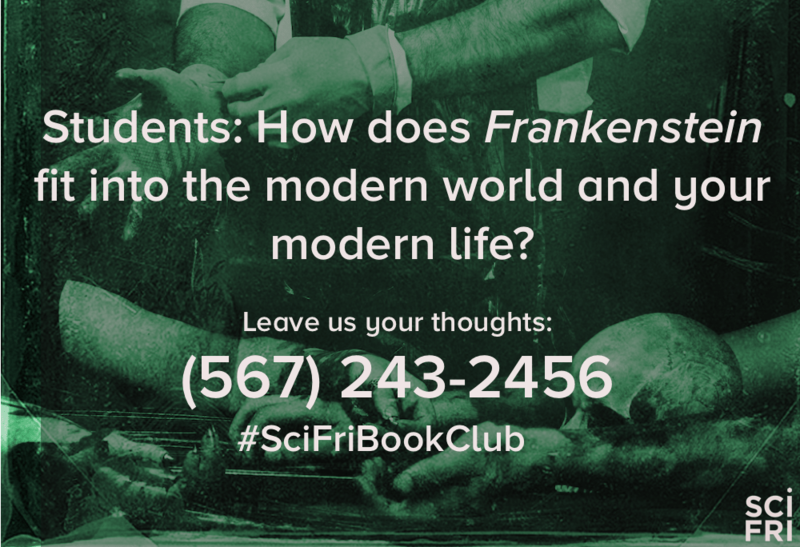 We really want to hear from students: How does “Frankenstein” fit into the modern world and your modern life? Give us a ring at 567-243-2456. Your comments may be played on the air. Keep checking back here over the next couple weeks! There’s more Frankenstein to come. Tony Gonzalez is a 10th grade student at New Technology High School in Napa, California. Chris Bach is an English teacher at New Technology High School in Napa, California. IRA FLATOW: The SciFri Book Club will now come to order. Thank you. We’ve been reading Mary Shelley’s Frankenstein, which was published 200 years ago in 1818. And like any good book club, we’ve been asking for your thoughts, your discussion questions, like is Frankenstein good or bad? Victor Frankenstein is a scientist. What are the modern versions of Victor Frankenstein and his monster? So we were asking you to think about that. And of course, we’re really quite excited about all things Frankenstein. So we wanted to share. We opened up a telephone voicemail box for your comments. And to our surprise and delight, one of our book club members was a little more excited than most. Book Club producer Christie Taylor tells the story. CHRISTIE TAYLOR: It begins with a name we would get to hear a lot. TONY GONZALEZ: This is Tony Gonzalez, shoutout to Napa, California. CHRISTIE TAYLOR: Tony is a high schooler at New Technology High School in northern California. 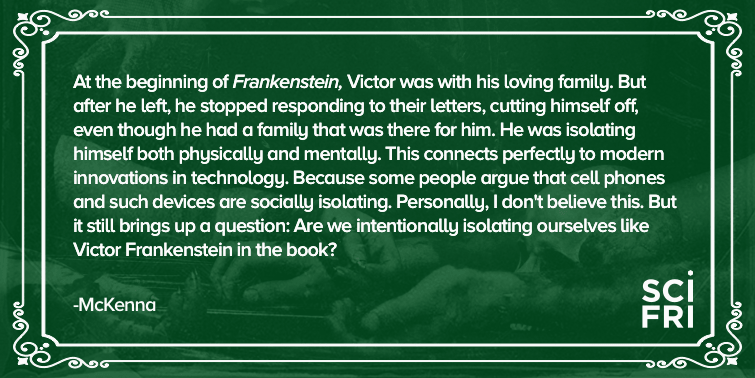 And when we invited listeners to call us with their thoughts about Frankenstein, Tony decided to call in with a different request– help on his homework. TONY GONZALEZ: We’re doing a project in class, and I’m going to have do a reading chart on Frankenstein. And if you wouldn’t mind helping with it, because I’m a little behind. And if you can please call me back, I’d appreciate that. Thank you. CHRISTIE TAYLOR: This chart he’s talking about, it needs to cover symbolism, plot, motifs, all of that good high school English stuff. And he keeps asking us for days. TONY GONZALEZ: It’s Tony Gonzalez, Napa, California. This is day two. I still need help. Hey, this is Tony Gonzalez. You guys have not returned my calls, and I’ve been asking– OK, this is day four, and you guys haven’t called. I might go to another radio station. I believe this is day seven or eight. I lost track. Please call me back. This is Tony Gonzalez, signing off. CHRISTIE TAYLOR: Tony, we are really, really sorry. To be honest, we didn’t call back because it seemed like a prank. Sometimes there was that laughter in the background, and we really probably wouldn’t have been much help with your homework anyway. Luckily, it turned out Tony didn’t really need us after all. TONY GONZALEZ: So I actually did my work, and I finally caught up without your help because you wouldn’t call me back. So we’re actually going to be calling you later today, so expect my call, OK? CHRISTIE TAYLOR: Two hours later, we got a call– plus about 50 others. SPEAKER 5: Yeah. Another one. CHRISTIE TAYLOR: It turns out Tony Gonzalez’s entire 10th grade English class was calling us, and each of them gave us a one to two minute statement about the themes that they saw in both Frankenstein and in modern life. SPEAKER 3: We actually in my humanities class are reading Frankenstein and learning about the Industrial Revolution. SPEAKER 1: My class is just reflecting exactly what you’re asking. SPEAKER 4: Frankenstein and modern day scientists share many traits. SPEAKER 3: We get tunnel vision because of the idea of progress, rather than considering ethical dilemmas. SPEAKER 2: With the rise of artificial intelligence, we never know when we could have the same thing happen in our own backyard. SPEAKER 3: Originally created for better communication, people tend to distance themselves from each other by using their smartphones. SPEAKER 2: We have used our intellectual ability to create horrible technologies, like weapons of mass destruction. SPEAKER 3: iPhones, or smartphones, for that matter. And it isn’t until after he achieves his goal of creating a life that he thinks whether or not this is really the best idea for the world to be introduced to. SPEAKER 4: Thanks for letting me share my thoughts. CHRISTIE TAYLOR: And we were really impressed with these answers. Some of these were the same questions we’ve been debating ever since we started the book club, plus some that we haven’t. And yeah, true to his promise, Tony also gave us a call. TONY GONZALEZ: As humans we’re always making progress, whether it be in technology or science. 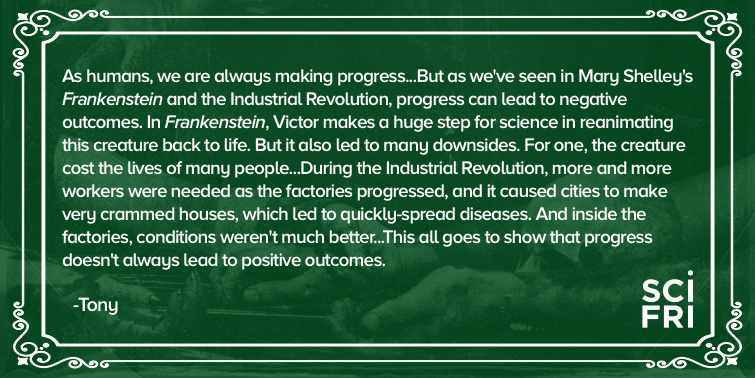 But as we’ve seen in Mary Shelley’s Frankenstein and the Industrial Revolution, progress can lead to negative outcomes. Thank you for letting me share my thoughts. Tony G, signing off. CHRISTIE TAYLOR: And that’s how one classroom is handling the really complex ethical questions that we’ve been reading about in Frankenstein, Ira. IRA FLATOW: Producer Christie Taylor is here with me. Thanks for sharing this story, Christie. And we got to meet the English class, don’t we? CHRISTIE TAYLOR: We sure do. So after all those phone calls we pretty much had to call Tony back– it would have been rude not to– and hear more about his project. And he’s actually joining us on the show today, along with his English teacher, who should get credit for starting the entire thing himself. IRA FLATOW: But we’re not going to be spoiling anything about the book for Tony or his class, are we? They’re reading it. CHRISTIE TAYLOR: No, no, no. So they actually just turned in their Frankenstein projects yesterday. I got to see some samples. And the timing is really perfect for us to talk about it now. IRA FLATOW: Wonderful. Thank you, Christie, for bringing us that story. Radio Producer Christie Taylor. And now, without further ado, let’s hear from the famous Tony G himself about his thesis. Tony Gonzalez is a tenth grade student, New Technology High School in Napa, California. And also with him is Chris Bach, English teacher at New Technology High. Welcome to Science Friday, Tony and Chris. CHRIS BACH: Thank you. I appreciate you having us on the air, Ira. IRA FLATOW: You’re welcome. Tony, I’m sorry we didn’t help with your assignment. Sounds like you got caught up in time, though. You did pretty well on your own. How did it go? TONY GONZALEZ: Well, yeah. It’s fine, first of all. But thank you for just reaching out. It went good. I got caught up with my work, and we had a good final product. IRA FLATOW: Yeah. We heard part of your statement from your voicemail, but I want you to tell us again what you think the biggest thing you really felt that Frankenstein taught us about progress. TONY GONZALEZ: Well, what I thought was that progress– we’re always making progress, but it doesn’t always lead to positive outcomes. So in Frankenstein, I saw that Victor made a huge step for scientists by animating this creature, but it also had a downside, where is the cost the lives of people. And it also ended up blackmailing Victor. IRA FLATOW: Very interesting. You really did read the book very well. 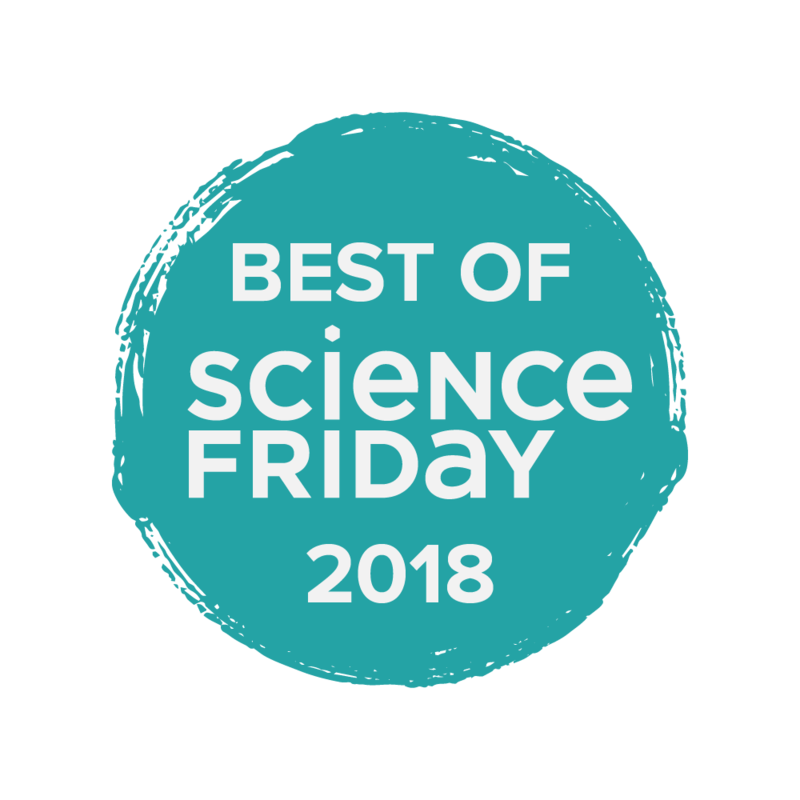 This is Science Friday from PRI, Public Radio International. Talking with a couple of Science Friday Book Club members. Chris Bach, Frankenstein turned 200 years old this year, so why teach it in 2018? Why did you assign the book? CHRIS BACH: Yeah, it’s an interesting question, especially with sophomores. Frankenstein is a difficult read, and the language can be difficult. But what’s interesting about Frankenstein is the thematic topics– nature versus nurture, knowledge, progress, the ethical considerations, and alienation. These are all themes and ideas that students today are thinking about in relation to themselves and the society of which they’re a part. So it’s so helpful for these students to read a text and see that these ideas have been things that people have been thinking about for hundreds of years, and it helps them better situate themselves and better understand how they can make a difference in their communities and in the future of the world. IRA FLATOW: And you know, we’ve been talking about how Mary Shelley was just a teenager. She was just 18 when she wrote the book. IRA FLATOW: Is that something your students could relate to? CHRIS BACH: Yes. We have a lot of students who are, in their own way, like young Victors. You know, grand ideas about the world and their place in it. And it’s so exciting for them to be able to kind of learn about the ultimate origin story, both of the Frankenstein mythos, but also just of a novel. I mean, the creation of this or the writing of the story was so interesting. IRA FLATOW: Tony. Were you impressed of how an 18-year-old could have written a book like this? TONY GONZALEZ: Yeah. I was really impressed because just looking at my writing and looking and just imagining how, in a few years, that was the age of Mary Shelley when she was writing this novel. IRA FLATOW: Do you think this is a book that relates to your life at all? TONY GONZALEZ: Yeah. I can see how I could relate that to my life. At first I was really– I was confused when I was reading this book. But now that I’ve understood it and I’ve read it all, I can see how I can relate this to my life. IRA FLATOW: You know, one of the things that surprised me when I read the book for the first time– maybe it surprised you– is that, you know, we’d all seen the Frankenstein movies. This book is so much different, isn’t it? IRA FLATOW: I mean, were you surprised by that too? TONY GONZALEZ: Yeah. What I was telling my teacher was that I didn’t realize that it was so dark at some points, that Victor had some dark moments in this story. IRA FLATOW: Yeah. And Chris, did you realize that too when your students were reading it? CHRIS BACH: Absolutely. And I think what’s so interesting about reading Frankenstein with students is that a lot of them, from television, movies, games, they have this certain perception of the story. And then to watch them as they kind of discover Robert Walton, and they’re in the Arctic, and then learn more about Victor and the creation of the creature, and then ultimately shift perspectives to the creature itself, it’s such an interesting way for students to start to understand how they relate to the world and for them to think about the ethics of just how you treat each other, and then how we kind of deal with science and progression as we look forward to the future and some of the really cool innovations that our students focused on in this project. IRA FLATOW: You know, we got a lot of students calling in. I guess all of your students. We haven’t talked to all of them. They all talked about how it affected their lives. CHRIS BACH: And we really did see that. I mean, the most obvious is with smartphones. Students today have a lot of experience using smartphones. And in one way or another it changes the behavior of how they interact with each other and with their parents and the community. IRA FLATOW: That’s really interesting. Thank you both for taking time to be with us today. Chris Bach, who’s an English teacher at New Technology High School in Napa, California. Tony Gonzalez, thank you both for joining us. We also want to thank the whole class. We had more than 50 students calling in. Wow, that was something. Thanks for joining us today. And you can check out more responses from Chris Bach’s class on our website, sciencefriday.com/students. And we only have one more week left with Mary Shelley’s Frankenstein. I’ve got some reading to do to finish it up. I got about halfway through. And we’re going to wrap up next Friday with author Elizabeth Bear, bioethicist Josephine Johnston, and your questions and comments. And like Tony and his classmates, you can call our voicemail at 567-243-2456. We especially want to hear from students and young people this week. How does Frankenstein fit into the modern world and your modern life? That number again, 567-243-2456. Also, check out our book club at sciencefriday.com/scienceclub. And join the newsletter and additional reading all about. Is Silicon Valley Making Its Own Monsters? The unintended consequences of the tech world, and what CEOs could learn from Mary Shelley.